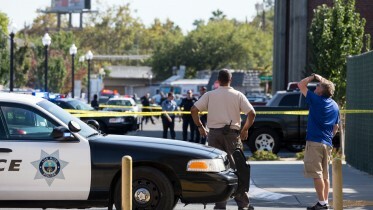 Photo courtesy Sac City Express. As I walked across campus today on my way from the parking garage to the cafeteria to get a bite to eat before my math class, something happened that I had never experienced in all the times I’d walked that very same path. I was stricken with the sadness of the major change that occurred less than 24 hours ago. When the person who shot and killed a City College student took it into his own hands to get revenge or to prove a point or to do whatever it was he wished to accomplish, he probably didn’t realize the multitude of people he would affect in the coming minutes, hours, days, months and years. As I walked around campus, there was a somber calmness in the air. Something just felt different. It didn’t help that today is Friday and very few people are on campus on Fridays, especially preceding a three-day weekend. I couldn’t tell if it was all in my head or if the people around me felt as down and depressed as I did about this situation. I had trouble glancing in the direction of the area of campus where the altercation took place. I had trouble focusing in class. It’s going to be a long time before the wounds heal for those of us in my situation, but I mourn for the people close to the victims. They are faced with a lifetime of grief and sorrow, and all because of a senseless act of anger that happened to involve a weapon. My wounds will heal in the next couple of weeks, but for some people affected by this, theirs may never heal. I’m going to avoid getting political because I want to focus my attention on the victims and their families. I also want to focus my attention on the friends, professors and acquaintances of the young man who lost his life as well as the other man who is lying in a hospital bed right now. However, I will say this: the gun violence has to stop. It is far too easy for people who don’t know how to be responsible with a weapon to get a hold of these things and this type of behavior happens far too often. That’s all I’m going to say on that front, but I urge everyone reading this to do whatever they can to help change the gun laws in this country. When I left campus, I walked out of the back door of the business building. This is only a few hundred feet from the crime scene. I shouldn’t even have to call it that. As I turned in the direction of the parking structure, my back to the area where the shooting took place, it was as if a dark cloud hovered directly over the college grounds. Sacramento City College is a place of learning. It’s a place where people take refuge from the world outside and work to better themselves in hopes of one day securing a long-lasting and fulfilling career. But on Thursday, it became another site where an argument among four people turned into something much worse. Even though this seems to be an isolated situation and not a random act of violence, it’s tough to walk the halls of the campus without feeling a sense of fear. I have every confidence that the men and women of the Sacramento Police Department and/or the men and women of the Los Rios Police Department will apprehend the suspect and bring justice for the victims. I applaud the efforts of my former colleagues on the Sac City Express, of which I was recently in charge, and I commend them for being fearless as they took to the campus and covered a difficult situation in the most sensitive and thorough way possible. If I were still on the paper, I would have been right there with them. It’s comforting to know that the newspaper is in good hands. I also thank the student-journalists of American River College who worked diligently to cover the story as well. And of course, I thank the professional publications for their efforts in covering the story. Lastly, I thank the men and women on the police force, medical team and the men and women of City College who all worked quickly and efficiently in making sure no one else was harmed. In closing, I’d just like to say that my thoughts and condolences go out to the family and friends of the victims of yesterday’s tragic incident. I hope we can use this experience to make the campus safer, find even better ways to respond if this type of thing ever occurs again (let’s hope it doesn’t) and, perhaps most importantly, I hope this continues to encourage folks to fight for change when it comes to gun control. I always like to try and find the best in situations, and if nothing more comes out of this tragedy, I hope more Sacramentans will feel inspired to push for a better America. This entry was posted in Opinion and tagged american river, arc, community college, daniel wilson, Express, los rios, opinion, Sac City College, Sac City Express (SCC), sac city shooting, SCC, shooting, student. Bookmark the permalink.